Food is the foundation of life: both sustenance for our bodies and the source of great pleasure. Juror Dr. Rebecca Senf is looking for photographs of food, defined in an inclusive way. She would like to see photographs that address what people eat, the relationship of food to love and nurturing, farming and food production, food allergies, repulsive food, food still lifes and even photographs about photographing food. Other types of food pictures are also welcome. This exhibition is open to anyone creating photographic images. All photographic and related processes are encouraged including digital, non-silver and photographic book arts. Pieces must not exceed 60” in any dimension. Submissions must be individual JPGs sized to 800 pixels on the longest side. Artists may submit one to five images for $35.00 in the Basic Application and one to ten images may be entered for $60.00 in the Expanded Application. Images of accepted entries may be used for publicity purposes and for presentation of the exhibition on the TWU website. 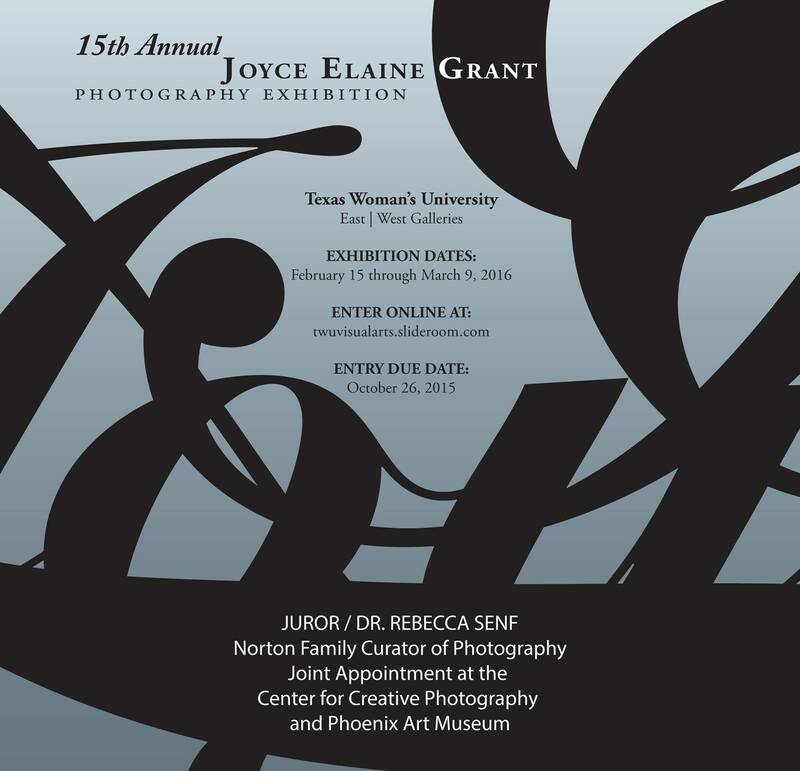 All fees are non-refundable and will be considered a donation to the Joyce Elaine Grant Photography Exhibition Endowment. Judging will be done online, through SlideRoom.com. Dr. Rebecca Senf is the Norton Family Curator of Photography, a joint appointment at the Center for Creative Photography and the Phoenix Art Museum. Senf grew up in Tucson and went to undergraduate school at the University of Arizona. She spent ten years in Boston, Massachusetts where she earned a Ph.D. in Art History at Boston University. In Boston she worked on the Museum of Fine Arts, Boston’s major exhibition Ansel Adams from The Lane Collection, for which she also co-authored the exhibition catalogue. In October of 2012 her book Reconstructing the View: The Grand Canyon Photographs of Mark Klett and Byron Wolfe was released by University of California Press. This entry was posted in Apply and tagged 15th Annual Joyce Elaine Grant Photography Exhibition, East | West Galleries, JEG, Photography, TWU, TWU Photo Nexus. Bookmark the permalink.